Last year’s loss to Virginia Tech was the sole loss in an otherwise perfect National Championship season. 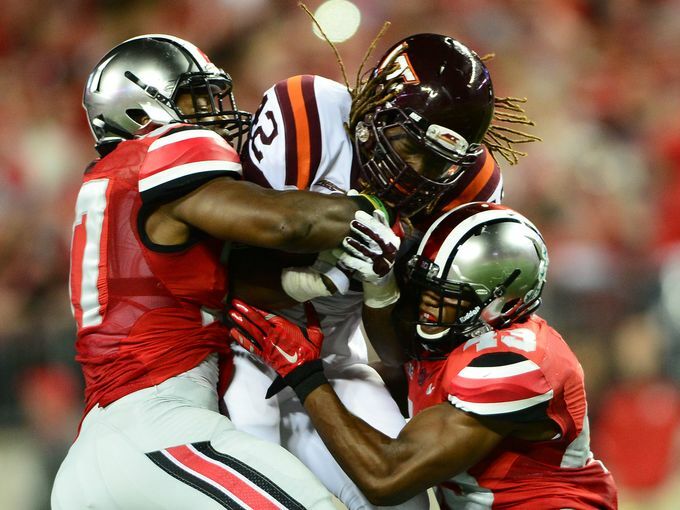 Monday, September 6th’s opener provides Ohio State with a chance for revenge! There was something fun about being an Ohio State fan last year. Sure, winning the National Championship was fun, but it was more that there were zero expectations. Every irreplaceable player was somehow replaced. And to whatever degree a powerhouse like Ohio State football can shock the world, they did. My Ohio State fandom has always been puzzling to those around me, so I figure an explanation is owed before I delve into why this upcoming Monday has me excited. I root for New York teams generally (unfortunately the Mets, Jets and Knicks), but there is no true New York college football team (sorry Syracuse, you don’t count). I was a St. John’s basketball fan, but they did not have a squad on the gridiron. Growing up in New Jersey could have allowed me to root for Rutgers, but that just seemed like a disastrous decision. The Scarlet Knights were a joke when I was growing up. In fact the football team did not post a winning record from the time I was born (1990) until I was a sophomore in high school (2005, Greg Schiano’s fifth season). But football, and specifically college football, was something I loved from a young age and was not willing to go without a rooting interest. So through the family tree I went looking for a connection. Mom and Dad are graduates of Brandeis University in Waltham, MA, a Division III school that does not have football. I am the oldest of three brothers, so I did not have an older sibling with a college team to adopt. So next on the list was my Aunt Michelle, who happened to be an Ohio State graduate. Simply declaring that I was an Ohio State fan was one thing, but clinching it was another. And two things made sure I was going to be a fan of the scarlet and grey forever. First, was a trip to Columbus, Ohio that my Aunt brought me on. I was young and impressionable and being surrounded at tailgates and a football game by 100,000 – plus other Ohio State fans was magical. They all dressed in the same colors, chanted the same cheers, sang the same alma mater and hated the same team (Michigan). I watched the marching band perform Carmen Ohio, I cheered every time the Buckeyes pierced the end zone and went home happy and devoted. Secondly, just as I was getting into the years where sports memories start to become indelible, Ohio State won a national championship. I was 11 years old and Ohio State marched into the 2002 Fiesta Bowl and National Championship Game 13-0. I invited friends over, threw whatever kind of watch party an 11-year-old can throw and I watched the Buckeyes down Miami for a national title (it was the right call, by the way). So there it was, ingrained in me from my youth – Ohio State football was a way of life on fall Saturdays. It would be easy to say that this year’s National Championship was a way of reliving my youth and that’s why it was so special, but that wouldn’t be true. What made last year special was that I had no expectations. Quarterback Braxton Miller, their two-time Big 10 Offensive Player of the Year, was injured and out for the season. In his place was a redshirt freshman, JT Barrett. Then the home opener ended in disaster as Virginia Tech left Ohio with a victory and what I assumed were Ohio State’s national title hopes. But as we all no, that was not the case. The Buckeyes rolled on as Barrett notched 45 touchdowns and finished in the top 5 of the Heisman Trophy voting — but not before breaking his ankle against Michigan and leaving Ohio State with its THIRD-STRING-QUARTERBACK. But that third-stringer, Cardale Jones, proved us all wrong winning the Big 10 title game, the Sugar Bowl and then the National Championship. It was thrilling, it was exhilarating, but mostly it was shocking. 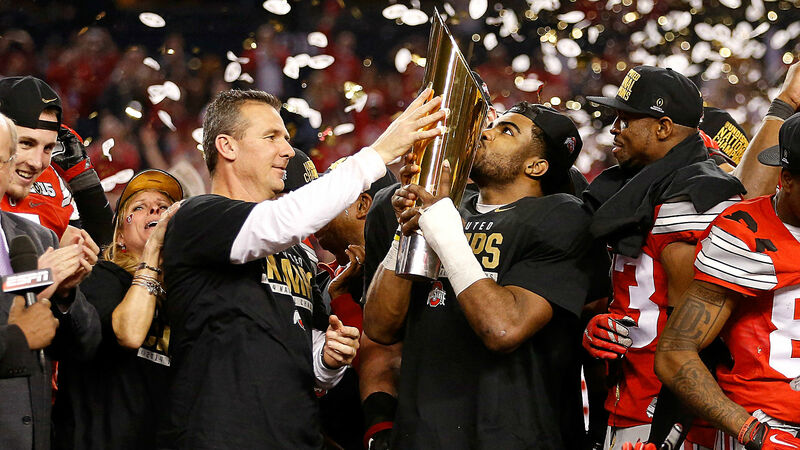 Urban Meyer, Ezekiel Elliott and company moved past the loss to Virginia Tech and celebrated a National Championship. So when Ohio State opens up this Monday, September 6 at Virginia Tech, it’s not just the chance to repeat as National Champions. It’s not just a chance to live up to expectations with both Miller and Barrett back healthy. It’s a chance for revenge. A chance to fix the lone blemish on an otherwise perfect record last year. It’s easy to be hyped for a season opener, but this one’s special. Monday night, in prime time, against the only team to upset the Buckeyes. Braxton Miller will be ready. JT Barrett will be ready. Cardale Jones will be ready. Ezekiel Elliott will be ready. Urban Meyer will be ready. And I’ll be ready. I have my lucky scarlet Terrelle Pryor jersey with me in Connecticut and my favorite Buckeye necklace hanging on the wall over my dresser. My new roommates will think I’m crazy as I scream O-H at the top of my lungs every time I feel necessary and constantly encourage players that clearly cannot hear me through a TV screen. But the target is on Ohio State’s back now. And as someone who’s been with them through the good times, it’s my obligation to enjoy this pressure filled year. And it starts Monday! This entry was posted on September 3, 2015 by Coach Sass in Miscellaneous.